XXL: Shoulder 61 cm/24” —– Sleeve 54 cm/21.3” —– Bust 122 cm/48” —– Length 72 cm/28.3”☆ It is perfect to pair with your favorite jeans or skinny pants for a playful, get dressed in this stunner and you can’t hide in crowd. ☆ Casual crew neck solid pocket design, make you look more stylish and fashionable. It can absolutely show you off. 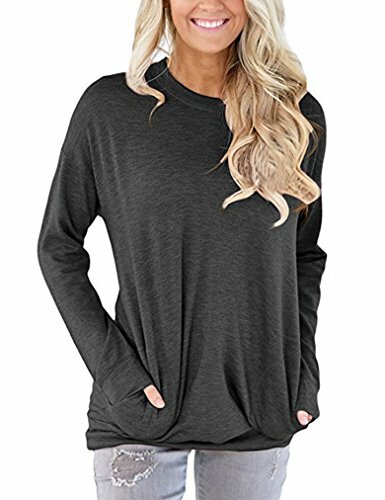 ☆ This lightweight round neck long sleeve top is perfect for those carefree Autumn winter days, you deserve to have it ! ☆ Notice： Please carefully check the size chart we provide. Due to the Batwing Sleeve, the BUST and SLEEVE will be a little bit error.